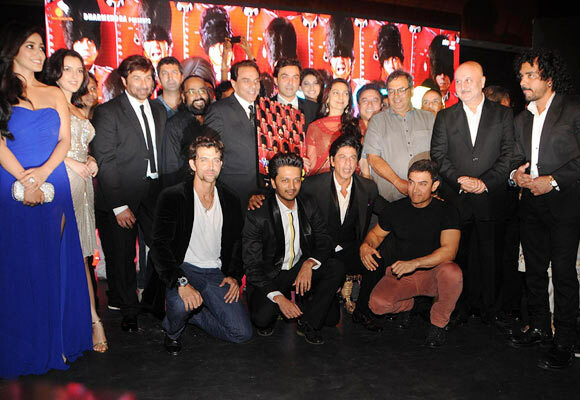 Rediff.com » Movies » PIX: Shah Rukh, Aamir, Hrithik dance with Dharmendra! 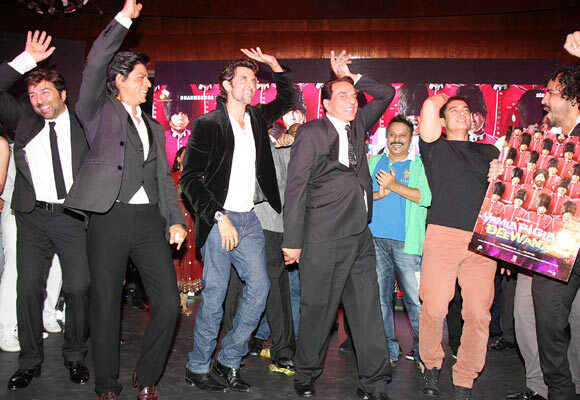 PIX: Shah Rukh, Aamir, Hrithik dance with Dharmendra! The music launch of Yamla Pagla Deewana 2 was a GRAND affair, as some of the industry's biggest stars turned up to support the film's cast, Dharmendra, Sunny Beol and Bobby Deol, at Novotel hotel in Juhu, a western suburb in Mumbai. Shah Rukh Khan, Aamir Khan and Hrithik Roshan even danced with the Deols in Dharmendra's trademark style to the song, Main Aida Hi Nachna from the film. Click Next to see pictures of the star-studded music launch. Dharmendra was in his element, as he made his moves on the dance floor, while the stars cheered him. "I want to give you some big news. I have not said it all these years -- I am the number one dancer of Bollywood!" Dharmendra exclaimed to the media present. In the picture: Neha Sharma, Kristina Akheeva, Sunny Deol, Kunal Kohli, Santosh Sivan, Dharmendra, Bobby Deol, Juhi Chawla, Subhash Ghai, Anupam Kher and music composer Toshi. Seated: Hrithik Roshan, Riteish Deshmukh, Shah Rukh Khan and Aamir Khan. Aamir whistles to the crowd while Anupam Kher cheers on, and Shah Rukh grins. 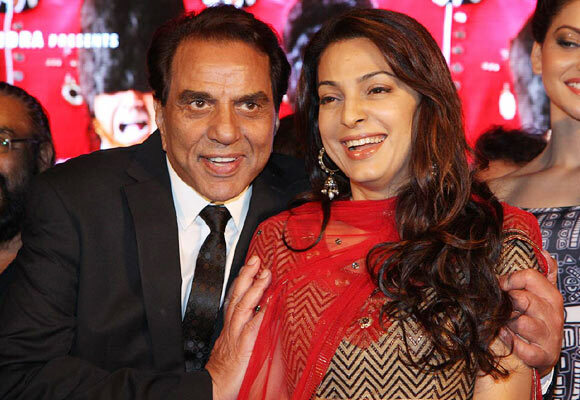 Juhi Chawla, who has had some hits with Sunny Deol in Darr and Arjun Pandit, shares a warm moment with Dharmendra. Neha Sharma plays Bobby's love interest in Yamla Pagla Deewana 2. Australian model and actress Kristina Akheeva makes her debut in the film. Akshay Kumar made a quick appearance at the music launch. Riteish Deshmukh arrived with wife Genelia D'Souza. 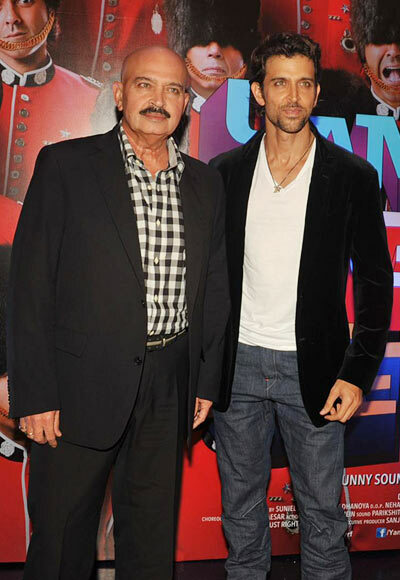 Father-son duo Rakesh and Hrithik Roshan took some time off from the shooting of Krrish 3 to attend the music launch. 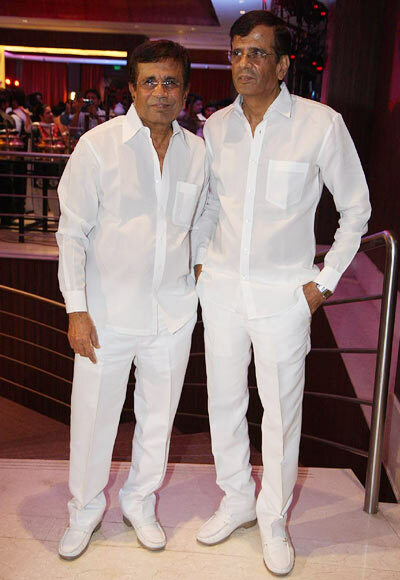 Director duo Abbas-Mustan, who directed Bobby Deol in the hit Soldier, were also present. 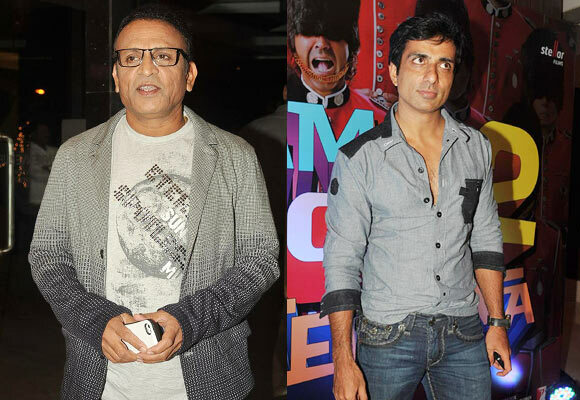 Actors Annu Kapoor and Sonu Sood pose for the cameras. 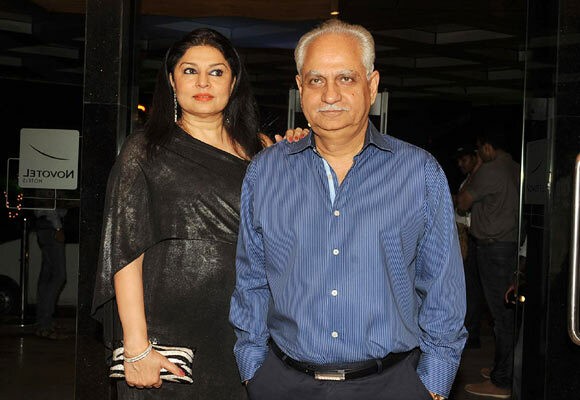 Ramesh Sippy, who directed Dharmendra in Seeta Aur Geeta and later in the cult classic Sholay, arrived with wife Kiran Juneja. TV actor couple Gurmeet Choudhary and Debina Bonnerjee, who were last seen in dance-based reality show Nach Baliye Shriman v/s Shrimati were also spotted.